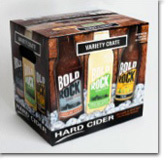 Bold Rock Hard Cider announced the launch their new style, Bold Rock Pear, at the end of 2014 which has been a big hit. 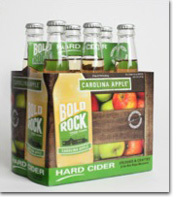 The seventh variety of cider in the Bold Rock portfolio based in Virginia is now being distributed throughout the East Coast from Pennsylvania through North Carolina. The addition of Bold Rock Pear marks the first time the cider producer is using an additional fruit in a recipe for its freshly crafted hard cider. To make Bold Rock Pear, company co-founder and internationally acclaimed cider maker, Brian Shanks, blended Bold Rock’s standby locally picked Blue Ridge-grown apples with New Zealand pears. The result is a golden pear hard cider that features a hint of tannins followed by a pleasant residual sweetness for exceptional balance and body. Opening in 2012, Bold Rock formed out of the partnership between Shanks and John Washburn. 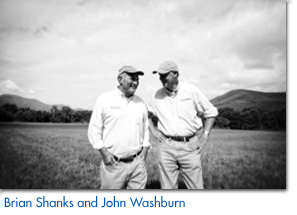 Washburn owned a picturesque piece of farmland in the Blue Ridge Mountains of Central Virginia, and on a whim he reached out to Shanks to see if the New Zealand native and cider expert would be interested in working his magic with locally picked Virginia apples. The two fast friends have since put together a rapidly growing operation, using state-of-the art equipment that is run by a hard-working staff of 32 local Nelson County employees to produce delicious craft cider. Last month, Bold Rock announced plans to finally begin producing their cider next month, May 2015, at the newly built facility in Mills River, North Carolina, near Asheville. Like Bold Rock’s flagship production facility in Virginia, the operation in Mills River will make craft cider from locally grown apples picked at nearby orchards. In North Carolina, apples will be sourced from Hendersonville-based Apple Wedge Packers, a fifth-generation family-owned business that has been operating for over 150 years. 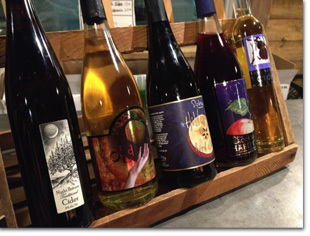 Headquartered in Nellysford, Virginia, Bold Rock produces five hard ciders and two wines. As Virginia’s largest winery, the company is quickly ramping up distribution across the country, now delivering variety packs that include three styles of the award-winning Bold Rock locally crafted ciders. The variety packs will include popular flagship offerings Bold Rock Apple and Bold Rock Draft, as well as the newly released Bold Rock Pear. 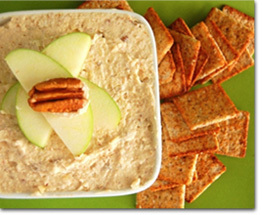 Bold Rock Apple has crisp and refreshing character, delivering the fresh taste of green Granny Smith apples. Bold Rock Draft is a more robust yet sessionable variety with a smooth and mellow taste that satisfies with a surprisingly complex broad blend of apples. 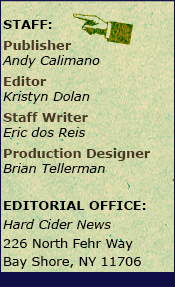 Additional information on Bold Rock Hard Cider can be found on their website at BoldRock.com. Photos were provided by Bold Rock Hard Cider. 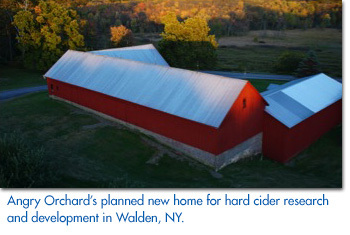 Angry Orchard announced a new home for research and development at a historic apple orchard in Walden, New York. The cider makers at Angry Orchard have been exploring different apple varieties and crafting ciders for twenty years, and are looking forward to greatly expanding that experimentation and driving innovation at their own 60-acre orchard, located in the heart of the Hudson Valley of New York State. This orchard is a particularly good fit for Angry Orchard due to its rich apple growing history and the region’s exciting craft cider culture. Also, the town, state and a number of local organizations have all been very enthusiastic and cooperative in helping the cider maker establish roots in the region. This location has been a farm since at least the mid-1700s, with the first apple trees dating back at least one hundred years. 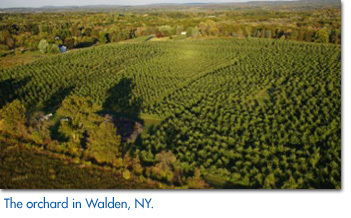 The farm was completely converted to a full-time apple orchard by the 1950s. During colonial times, hard cider was a popular beverage in the US and the Hudson Valley was known for growing traditional cider apple varieties. Prohibition dealt a serious blow to hard cider production, and orchards began shifting production to culinary apple varieties out of necessity. Even today, traditional cider apples are hard to find here in the US. Angry Orchard plans to plant traditional bittersweet cider apple trees and other heirloom varieties on the orchard over the next several years. Today, the orchard grows a number of apples, including varieties like Empire and McIntosh. Angry Orchard also intends to build a small cidery on-site with cider making equipment specifically designed for small batch experimentation. Using different ingredients, apple varieties, recipes and processes, the cider makers will develop innovative ciders to share with drinkers at the orchard that could eventually become part of Angry Orchard’s family of ciders available nationwide. The cidery plans to be open for visitors beginning in late fall, so drinkers can visit to learn how cider is made and try samples of exclusive, handcrafted Angry Orchard ciders made on-site. 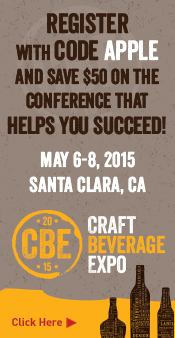 While craft cider has seen explosive growth in recent years, it is still small and relatively unknown here in the US. To help continue that growth for all craft cider makers, Angry Orchard encourages drinkers to learn as much as they can about cider, and sees the orchard as a place people can come to explore. The Crist Family, the orchard’s previous owner, has a long history of growing apples in the region, and had owned the property since 1963. The family will continue to cultivate the orchard and retain all jobs associated with caring for and harvesting the land. With the cidery, Angry Orchard plans to add new jobs in the greater Walden community. 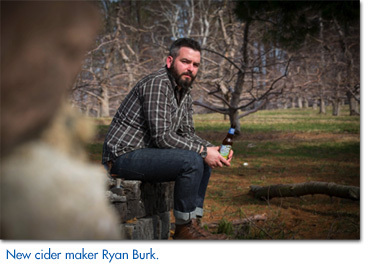 Angry Orchard recently added Ryan Burk to the team, who will be the head cider maker on-site at the orchard. Ryan grew up in Upstate New York and began working in orchards at the age of six. He brings a breadth of life-long knowledge, passion and experience in cider making to the role. Previously, Ryan served as the head cider maker at Virtue, a craft cidery in Michigan, and led a large barrel-aging program. Ryan joins the other Angry Orchard cider makers in their commitment to experimentation and development of unique and innovative Angry Orchard cider styles. Ryan and the other Angry Orchard cider makers will focus on a list of research topics like wild fermentation processes, barrel aging and unique apple varieties, particularly those known to grow well in New York. They are also exploring opportunities to work with local universities and community organizations, as well as other cideries, on additional research projects to maximize apple harvests and test new varieties. Angry Orchard also releases a new seasonal cider earlier this month, Angry Orchard Summer Honey, which will be available from now until August. This cider is smooth, light and refreshing with just a hint of honey sweetness and aroma to complement the bright apple notes from American culinary apples, perfect for warmer months and outdoor entertaining. 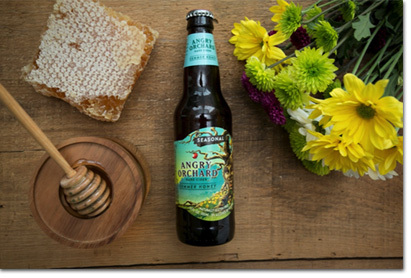 After experimenting with a variety of honeys to achieve a balanced taste and aroma combination, Angry Orchard’s cider makers found that wildflower honey – which includes nectar, converted by bees into honey, from a variety of plants and wildflowers that bloom during the summer – was the perfect fit. The honey imparts subtle and smooth floral notes, adding a depth of flavor that’s not overly sweet and pairs well with the cider’s fresh apple taste. Similar to some of Angry Orchard’s other craft cider varieties including the cider maker’s newest year-round style, Hop ‘n Mad Apple, Summer Honey is made with American culinary apples including Gala, Fuji, Red Delicious, Golden Delicious, and Granny Smith. In developing the recipe for Summer Honey, Angry Orchard’s cider makers found the light fruit-forward juices from Washington State’s culinary apples allowed the delicate floral honey notes to best come through. Kevin Gillespie, former Bravo Top Chef fan favorite, Pure Pork Awesomeness cookbook author and Gunshow restaurant owner, find the natural sweetness of hard cider to be the perfect complement to a variety of cuisines and dishes, and the seasonal Summer Honey is no exception. “Whether you’re exploring spicy and bold cuisines such as Thai or Vietnamese or simply out back with friends grilling up some traditional American barbeque, Summer Honey offers great versatility when pairing with food. 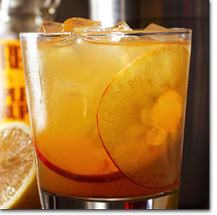 Its light effervescence and easy drinking make it a perfect seasonal drink,” said Gillespie. Angry Orchard Summer Honey is 5% ABV and is available in 6-packs for a suggested retail price of $7.99-$9.99. The cider is also available in 12-pacs and variety 12-packs with other Angry Orchard styles for $14.99-$17.99. Consumers can also find Summer Honey available in 16-ounce cans for $1.79-$1.99 or 4-packs for $6.99-$7.99. 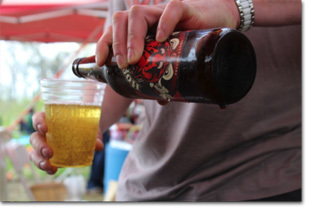 To find out more about Angry Orchard and Summer Honey, please visit them online at AngryOrchard.com. Photos courtesy of Angry Orchard. Hicks Orchard, the orchard that owns Slyboro has been around for 109 years but it wasn’t until 1974 when it was picked up by the Wilson family. In 2007, Wilson added cider production to the farm in addition to having his U-Pick operations which is when Slyboro Ciderhouse was born. It is easy to see the passion that Wilson has for his ciders as he began speaking about Slyboro in its infancy. 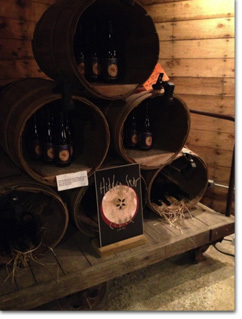 Wilson started with many cider batches at first with each one only using only one type of apple variety. By doing this, he was able to identify the different notes that each apple would bring to the cider, allowing him to determine which apples to mix in order to create the ciders he was envisioning. Wilson opened his tasting room in July of 2007. Today, Slyboro has a variety of different ciders with varying carbonation, sweetness, and everything in between. Wilson’s attention to quality is evident in that instead of just putting his ciders on sale right away, Slyboro had to hold off on distribution at first because they wanted to make sure they could make a consistent product and continue to produce enough volume to supply demand. Night Pasture – This is a light, still cider which Wilson said was made from traditional American and English cider fruit. It is very easy to drink and slightly dry with a surprising 8% ABV. There are hints of spice and caramel that are noticeable in the nose and mouth. Hidden Star – Wilson highlights this cider as the Slyboro flagship cider. It is sweet and fruit forward in the nose. Very clean and semi-sweet in the mouth. Both Liberty and Northern Spy apples are used to create this 8% ABV cider. Black Currant – This cider is different from the others in the Slyboro portfolio. Wilson adds black currant to a mildly sweet cider after fermentation. This cider has great clarity, is purple in color and you can definitely smell the sweet currant in the nose. There is a slightly tart apple taste and currant is more forward to start but slowly subsides to a very nice sweeter berry-like taste. This cider has a 6.9% ABV. Ice Cider – The Slyboro Harvest Ice Cider is made in the traditional way ice ciders are usually made which is by storing apples in totes outside for a few weeks until they are hit with a deep freeze that makes the sugar and juice more concentrated. Wilson then allows the apples to thaw slowly and makes this delicious cider with them. The Ice Cider has notes of spice and honey aroma with hints of fruit. Upon initial tasting, one would notice the warming mouthfeel and taste of sweet apple and a little tart. Some spice can also be tasted with the 11% ABV. 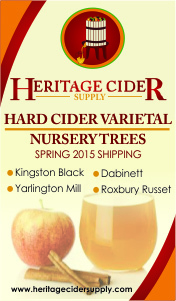 Kingston Black – This cider, which is a famous English cider variety, is a dry cider that has a lot of complexity and bold flavor plus subtle sweetness. This cider has an 8% ABV. As a second generation farmer, Wilson talked about how he likes experimenting with many different apple varieties. He is slowly introducing new varieties to the orchard, but at $10,000 an acre and a 3-5 year turnaround time on the actual fruit, it takes some time. However, Slyboro produces over 9,000 gallons of cider a year so keep a look out for new and exciting cider varieties to come! We’re looking forward to a pommeau that Wilson mentioned he was working on back in November 2014. 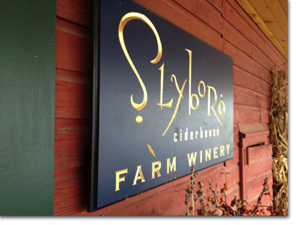 For more information on Slyboro Ciderhouse, please visit Slyboro.com. Photos courtesy of Kristyn Dolan. Pennsylvania local hard cider producer, Frecon’s Cidery, is teaming up with event promoter, Starfish Junction Productions, to continue the English tradition of ‘wassailing’ in an American way. Historically, Englishmen that celebrated a wassail would gather in orchards during the winter and sing chants/carols and dance together to awaken the cider trees, scare away evil spirits in the orchard, and toast the health of the trees to ensure a plentiful harvest in the fall. The Wassail at Frecon’s Cidery won’t have any chants or carols but it will have plenty of music and drinking, with dancing if you prefer! 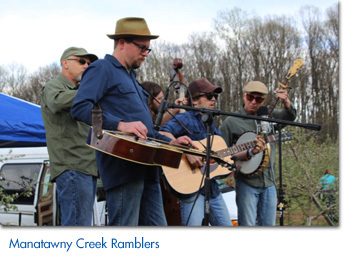 The 2nd Annual Wassail at Frecon’s Cidery will be taking place on Saturday, May 2, 2015 at Frecon Farms in Boyertown, PA and will feature local bluegrass, jazz, blues and improvisational rock band favorites including the Manatawny Creek Ramblers, The Cider House Band, and Flux Capacitor who will perform live in the orchard. The entire Frecon’s Cidery portfolio of hard ciders will be available for tasting, including The Crabby Granny, The Early Man, The Hogshead and Apfelwein – all gluten-free and made from apples grown right in the Frecon Farms orchard. Persons of all ages are welcome to attend. Food trucks like WildeFire Wood-Fired Pizza and Oink & Moo BBQ will serve up delicious foods for you to purchase that will pair with your cider(s). The Frecon Farms Bakery will also be in attendance serving up sweet and savory delights including a cider braised pulled pork sandwich with apple onion barbeque sauce, spiced sour cream donuts with hard cider caramel glaze, and Frecon’s FAMOUS apple cake. There will be seminars about making hard cider, demonstrations about cooking with hard cider, and a cheese and hard cider pairing. A contest was also held online via the event website to crown a couple the king and queen of the wassail. To enter, contestants had to show off their best impression of one (or more) of the Frecon’s Cidery characters on the various labels – The Hogshead, The Early Man, and The Crabby Granny. The contest winners will be announced at the event and win a year’s supply of cider – visit the website FreconsWassail.com for details. 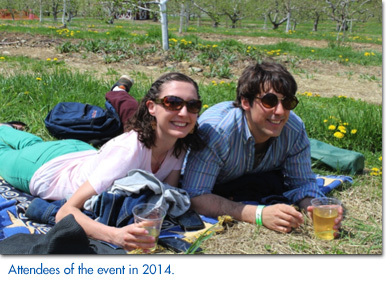 The Wassail at Frecon’s Cidery will take place rain or shine on May 2, 2015 from 12pm-5pm outdoors in the picturesque Frecon Farms orchard. Tents will be provided for shade and shelter. Attendees are encouraged to purchase the special ticket offer in advance which is available online at FreconsWassail.com - $20 per person gets you a souvenir pint glass and three drink tickets (must be 21+; valid photo ID must be presented upon entry; each drink ticket is good for one pint of cider). Drink tickets will be available for purchase at the event. Children of all ages are free to attend. For additional information, please visit the website FreconsWassail.com or call 631-940-7290. Photos courtesy of Kristyn Dolan. Approaching the Beak & Skiff farm in LaFayette, New York, one would come across a large barn. From the outside it looks like a very traditional barn that you may find on any farm, but on the inside contains a beautiful tasting room and café that houses a full range of ciders as well as vodka and a gin from the 1911 cidery and distillery all made on the farm using apples from the farm. 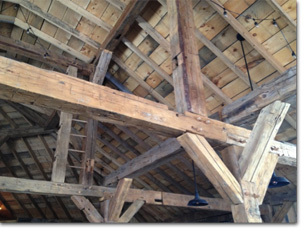 The 1911 barn, which only finished construction in August 2013, was made using pieces from about five or six old barns from Pennsylvania, each around 100 years old. The company decided to build using these old woods so that the feel and history of the new construction was from the same time period as when the Beak & Skiff General Store was built. This homage to heritage and effort to maintain history is how 1911 was named. The name 1911 is the year the first Beak and the first Skiff got together and established an apple orchard business on 100 acres with only about 150 apple trees. Today, members of the 5th generation of the Beak and Skiff families still operate the farm. However, Beak & Skiff plants approximately 20 different apple varieties on about 800 acres and still has another 400 acres they can grow on not currently used. In 2013, the company planted almost 15,000 new trees! Original: This is 1911’s best seller, at 5.5% ABV, it is not super sweet but instead closer to a European style cider. It is lightly carbonated with medium body and caramel notes. The cider is balanced and tart, aged with American oak and semi-dry. Raspberry: This cider is the Original cider as a base but is blended with a raspberry puree added during fermentation from locally grown Raspberries. At 5.5% ABV, this cider is almost champagne like with hints of raspberry; it is not overly sweet but very crisp and refreshing. The raspberry is subtle compared to other raspberry ciders available on the market but you get a raspberry burst on the finish. Blueberry: Similar to the Raspberry cider, this cider uses the Original cider as a base with a blueberry puree added during fermentation from locally grown blueberries. At 5.5% ABV, this cider is sweeter then the raspberry variety, with a definite noticeable blueberry flavor but still considered semi-sweet. All of the ciders are made with the same base and the taste is determined by residual sugar. Heritage Dry: At 6.9% ABV, this is a dry sparkling cider with some acidity and notes of vanilla and caramel. The cider is fermented at cool temperatures then aged in American and French oak barrels. Hopped: At 6.9% ABV, this is a dry cider with classic American bittering and aromatic hops. It is very floral in the nose with a slight fruity sweet aroma. The taste is not as sweet as it smells though but the bitterness gives a smooth, slightly resinous finish. Rosé: At 6.9% ABV, the Rosé is a very unique and interesting cider. This cider perfectly blends a sparkling cider with locally grown Noiret and Chancellor Grapes. The grapes give the cider a light rosy color, aromas of tropical fruit and flavors of strawberry and pomegranate. 1911’s ciders can be ordered online from their website and delivered. 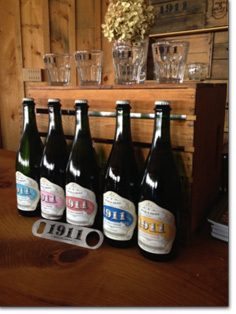 Alternatively, 1911’s standard line is available in 750ml bottles in the tasting room. The Original and Raspberry 12-ounce six packs can be found in retail locations such as Wegmans. 1911 is distributed by Manhattan Distributors in New York City. The reserve line is only available in 750ml bottles. Interesting fact, prior to 2014, 1911 was operating their cidery out of a one car garage – all production, bottling, and kegging! In 2010, after the success of the hard cider line, Beak & Skiff Apple Orchards launched into the spirits business with small batch made vodka and gin. The 1911 Spirits brand was the first in Onondaga County (New York) to hold a distillery license and first to produce gin! Vodka: This small batch vodka is distilled from apples. By using the apples to distill, 1911 has given its vodka vanilla and caramel notes while still maintaining a crisp smoothness that quality vodka is known for. It is 80 proof (40% alcohol) and distilled three times from the Original cider. Gin: This small batch 88 proof gin uses 1911’s premium vodka and builds on it with an expertly balanced bouquet of botanicals. Instead of just dumping botanicals into this gin, 1911 decided to add them subtly while letting the base flavors shine though through a vapor process. Juniper, coriander, licorice, and citrus add exceptional notes that compliment the caramel and vanilla notes from the base vodka used. 1911 used about half of the juniper than other available gins on the market. This gin is wonderfully smooth and perfect for a gin and tonic or even on its own. Although the ciders a commercially available in many areas, the spirits have really taken off and are even available at airports across the country including LAX (Los Angeles), JFK (New York), SFO (San Francisco) and on Carnival Cruise Lines (20 different ships). The vodka and gin can be purchased at many New York liquor stores in 750mL bottles. In the coming year, we can hopefully see more 1911 Spirits available in the market since a new still is currently being produced for the distillery’s expansion. 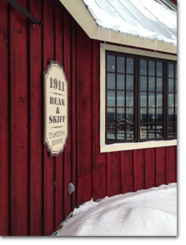 Beak & Skiff and 1911 have grown into quite the orchard creating some great tasting small batch cider and spirits all while still maintaining its traditions and never sacrificing quality. Much like their brand new beautiful facility, 1911 is a top of the line premium operation surrounded in years of tradition, character, and family. 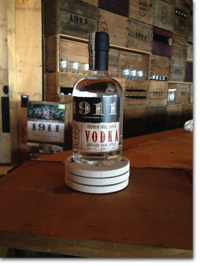 For additional information on 1911, please visit them online at 1911Spirits.com. Santa Sidra Hard Cider was among the groups presented with a Sustainable Santa Fe Award by the City of Santa Fe and the Santa Fe Green Chamber of Commerce this month. The Sustainable Santa Fe Awards program recognizes model sustainability projects that are helping Santa Fe, New Mexico, reduce its ecological footprint, mitigate carbon emissions and build resilience in the face of climate change. Santa Sidra Hard Cider won its sustainability award for Food System Adaptation. In 2014, Santa Sidra Hard Cider, began producing 100% of their award-winning, hand-crafted hard ciders from 25 tons of “rescued” apples purchased from New Mexico growers. These were apples that would have been left in the orchard to rot because they were blemished, too small or otherwise unfit for sale at local stores or farmers markets. This new income stream for local farmers, which totaled more than $25,000 in 2014, helps keep the local Santa Fe farms alive, preserves New Mexico’s unique agricultural heritage, keeps money in the local economy and creates local jobs. Locally-sourced, locally-made and locally-distributed, Santa Sidra is a premium hard cider hand-crafted in Santa Fe, New Mexico by husband and wife team, Mike and Stacy Zercher. To learn more about Santa Sidra, please visit SantasSidra.com.